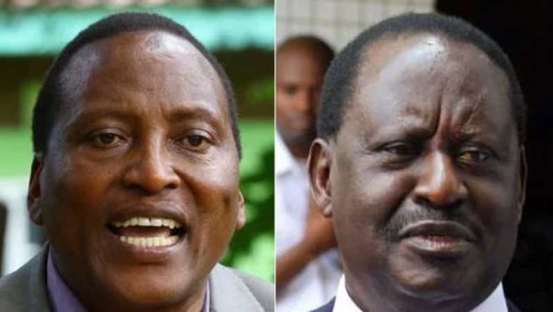 A NASA mp has told raila odinga that it is over for him after The national resistance movement leader Raila Odinga said he is ready to take instruments of power. NASA mp reminded raila odinga that Uhuru Kenyatta has military backing while raila even if sworn in will not have instruments of powers. Richard onyanka the kitutu chacha mp said that raila attempts to take over power from Raila Odinga is like a frog trying to stop an elephant from drinking water. "For me it's not something to discuss, it has been overtaken by events. Raila does not have the instruments of power, he does not have the military"
He urged that Uhuru Kenyatta and raila odinga that Kenya is bigger than anyone and they should talk about the way forward and not elections as election period is over. The mp said that raila odinga should just stop his attempts to be sworn in an continue with his life away from politics after dialogue. Photo:Onyanka and Raila photo courtesy.